First up is the Shas'vre of what will be my Tau team. Stealth suits aren't great for characters mainly because they are very uniform in design and unlike the likes of other models you can't just take their helmet off to show the creature inside. So I had a think about this and came up with a solution I am working on where the helmet splits apart to reveal the face. I am just doing some GS work and general clean up but it's fun to toy around with this idea. My immediate thought after seeing the pictures I took was I need to put that eye sensor on a stalk that folds down. The general idea behind it is that the bar on the front slides in on itself before sliding into the two side pieces, what I am going to do is have the eye piece fold down so you can see more of the face. For the Stealer Cult I've modified the Patriarch model to represent a large Genestealer that is on the verge of becoming a Patriarch but not quite yet. I've removed the spikes partly to represent this but mostly because I got tired of stabbing myself with it. Then lastly my Harlequin troupe just awaiting some painting time. This is a army I've wanted to try now that they have been released in plastic since but I've never really had an incentive to do so. I used to play them in the RT days and this is a nice way to dabble in them. The central Player is made from the Death Jester, I figured it'd be something a bit different to have her perched on a dead Inceptor marine that the Troupe has just dealt with. Your sculpting and kitbashing express some good ideas. I like the Tyranid proto-Patriarch and the opening Tau stealth suit. Whoa, that's a pretty cool idea for the Stealth Suit. How large are Genestealers supposed to be because I've seen people use the Patriarch as a "true scale" one before. Duskwalker: Cheers, I think they are pretty big but maybe not quite as big as this guy, I don't really know if they have ever given an exact size. My logic is to give it the extended carapace upgrade to sort of explain away the size a bit and I've stuck him on a smaller base. I imagine this guy being the absolute upper size limit of what a stealer can grow to before becoming a full Patriarch. Bit more on the Stealth suit but I now need to do all the clean up on her. the basic frame and idea is in place now I just have to go to town on the GS work to clean up all the rough areas. The idea being that the eye piece flips up on the arm and slots into the helmet as the two sides close. Cor, love the Tau suit. I like the idea of the faceplate tilting forward, too. Very Ghost in the Shell. "KIL" is an old Rogue Trader art reference which I can't seem to find an image of. Funnily enough, while searching, I found a couple with 'Kil', some with 'Kill', another with the 'K' backwards (so rebellious! ), and one hero with 'DIE SCUM'; presumably aiming to help out any German-speaking foes that they are, to him, 'The Scum'. Edited by Apologist, 01 August 2018 - 11:57 AM. That's the picture I was trying to remember, thanks for that it was driving me nuts. I hadn't actually thought of the ghost in the shell but I think I will have to take a look at that for ideas, that's a great suggestion. How in the sam-heck did I miss this? It's awesome to see your handiwork again Doghouse! Your marines are looking great! I actually REALLY like the Thunder Warrior you posted earlier. The plastic kit you used and the sculpt work is ace. However, your KT goodies are going to steal the show for me. I like what I am seeing but I LOVE that stealthsuit! I remember buying a pack of those for 6th ed Kill Team (when it was dull) and was stumped what to do with them aside from trying to paint them with their stealth camo going into effect. Having the helmet upon up like that is awesome! Functionally illiterate Astartes? Did people in the 1980s actually find this "hip" and/or "edgy"? Hushrong: Thanks mate. I do have a few Thunder Warriors I was working on so a Kill Team of them is not out of the question. Bjorn Firewalker: It was more of a sci fi quirk of that time I think. It's very 2000ad in many respects but a fairly strong theme of 40k at the time. I think a lot of it might have been that marines weren't really the noble warriors as we know them now and were recruited from convicts, primitive cultures and hive gangs. It could be that the idea was that they were illiterate or using some form of low gothic. All the cool kids were doing it though. Space Marines weren't really seven foot super human warriors back then. I look forward to seeing them. Only a few months ago my gaming group thought about going back to Heralds of Ruin for weeknight gaming and the Thunder Warriors were a strong contender. They just seems like a fun and dangerous group! When you get to building up more for a team believe that I will be watching with excitement. Best looking Ineptor I've seen Mate . Those are some amazing conversions! Even if they are foul Xenos I’m not normally a fan of the Tau aesthetics, but I absolutely love what you’ve done with that stealth suit! Genius brother! I like the open Tau suit. Whilst I get where Apologist is coming from (being a huge GitS fan myself), but the suit reminds me of a Landmate from Appleseed. That or the Motoslave from Bubblegum Crisis (2032/original version. 2040 was awful). Great looking stuff, Doghouse. Love that open stealth suit. Killteam scares me because I want to make a kill team from every faction. I'm hoping to resist. I dunno how I missed this until now, but damn, sorry to hear about your health issues. Glad to see you're still able to enjoy your hobby AND crank out some awesome minis. I love that tau stealth suit with the helmet split open! Hushrong: Thanks mate, when I get around to it I'll try not to let you down. Deathspectersgt7: Thought you might approve. Aqui: Thanks mate. The logic behind it was I wanted to be able to show the face of the T'au pilot but without the helmet element it looked a bit odd. So I had a bit of a think about it and the crease along the top struck me as being an ideal point to split the helmet . rednekkboss: Thanks mate, yeah know that feeling. Brother Chaplain Kage: Thanks mate. Ok bit of an update, it's getting there but still need a lot of cleaning up work. Shas'vre with Burst Cannon, Marker Light and Target Lock. Which leaves me something like 25 points. If you're looking to fill points, perhaps a kroot tracker (counts-as Pathfinder)? That's a treat for the eyes my friend! Apologist: That's not a bad idea mate. I thought this might be interesting and took a picture with one of the marines I am working on. Both are some way from being finished but I want to show the grottier style contrasting the cleaner plastic looking alien T'au. I will scratch up and add markings but I want a much cleaner alien feel to contrast against the brutal battle worn feel of the Imperials. Since Tau are more ranged combatants(last I remember from rules and fluff) could there damage be from projectiles? Impacts from hard rounds that impacted and ricochet plus burns and melted bits from energy weapons. Shows off where they were super lucky or shrugged off shots from enemies they were picking apart from a distance. Then on the other hand have the marines have some projectile damage but showcase more scarring from various melee weapons to provide evidence that marines like to get into a scrap. Good job on the stealth suit. How will you decorate the xeno's base? Some fantastic new work! The Tau suit with the open visor is just genius, and I also really enjoy the Reiver-based Sergeant -- the paintjob on the face is so characterful! Brilliant! hushrong: That is definitely something I'll look into. I think the key is to make the material damage look alien. Imperial stuff tends to be scratches exposing the silver metal underneath but I picture the T'au using more exotic materials. Bjorn Firewalkerr: Not sure just yet. I may try my hand at a T'au terrain base or something grotty to contrast like pipes and things. Something dark might work. Well I sat down with all my DW parts that I had carefully acquired laid out in front of me and I started to work on the Primaris but at that point I lost all enthusiasm. I'm not sure why but no matter how I try to like them I can't get past the blandness of the Primaris. Being practically truescale I should love the models but for some reason I just don't. I think I am struggling in general with the design and lore choices since the Fenris campaign book came out and I'm just not feeling it anymore. So I turned to my bits box and thought well I will just make something, just go with the flow. No big plans, no huge conversion ideas, just make and paint something. So I made a Word Bearer. For some reason the grey has come out much lighter in the pictures above. As I've always liked the idea of "Before they were Traitors..." I went for their pre-Heresy markings and colour scheme. 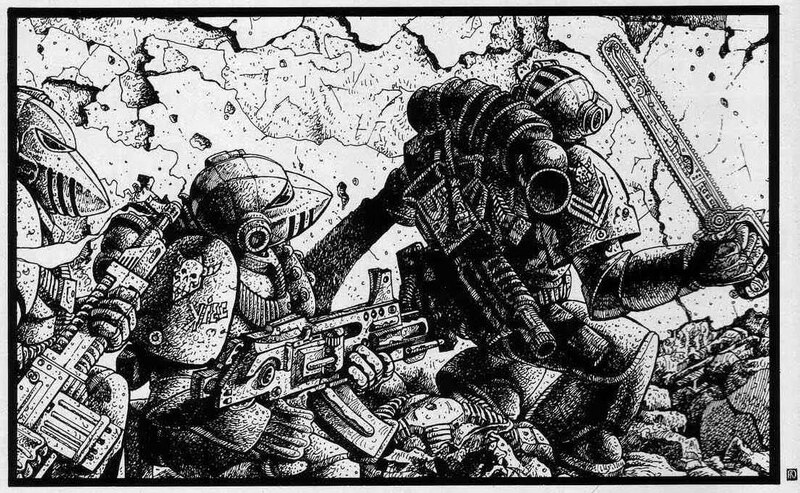 Despite all the decades that it has taken to form the over all picture of the Heresy and how this Legion were good guys and this Legion were bad and this Legion was morally grey there was a time when they were all heroes. 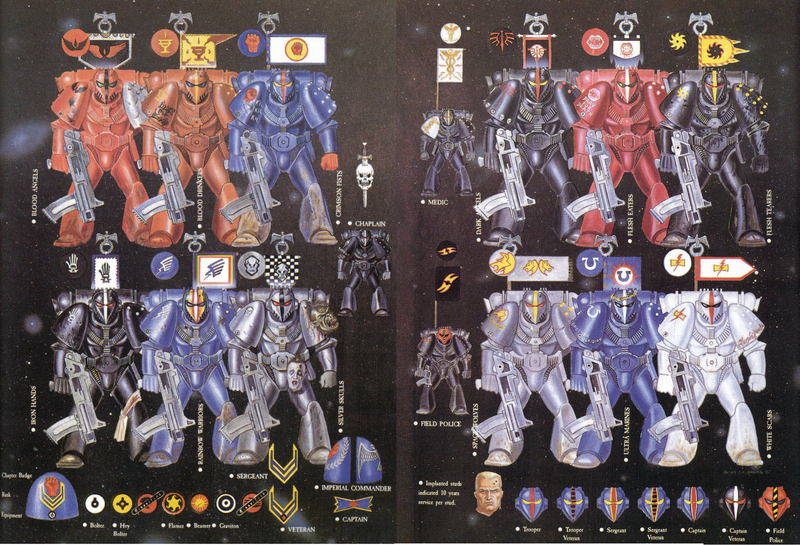 Some had chequered pasts but they all initially fought for the same team to carve out the Imperium of man and that really appeals to me. So I am just seeing where they go for now, a Great Crusade era Word Bearers Legion set probably a little after being re-united with Lorgar. I'm playing around with some spare guys in red to do the Serrated Sun Chapter to put in to bulk them out a bit later following Istvaan. I think the beauty of these guys is that I could make an army of them for both 40k chaos and 30k rebels/loyalists. I might have to do a tutorial vid on how to make these guys. Hahaha. I love how it went from putting DW primaris to the side, then making a Word Bearer, to just casually making 10 more! I really do love seeing your truescale work! I have always likes truescaled marines as it was more accurate showing off how big these marines in their armor are but I never got into it. The time, money for materials, and skill were above my reach. Now I've been dipping my toes into it with betrayer41's berserker conversions. Since I can't go back to regular marines I have been using the primaris to make bigger marines. It's tough because I find the chest dull with the winged skulls. I've copied TheTrans Astral Claws and have been adding mk3 armor to the front to bulk it up. The knees are very distinct and I have tried using plasticard to make it look like mk4 more closely. Now I'll be copying betrayer again using some shapeway kneepads. I do hope you find a way to pizzazz them up! It took me awhile but I have found some bits and bobs to make them work in my eye. Always a joy seeing you dabble with true scale Astartes, especially when related to the Horus Heresy. What you have planned for the Word Bearers sounds intriguing, looking forward to see more.